I’m going to go through another exercise you can try on your horse to help you open up your chest. As mentioned previously, hunching forward places more weight on the front of your horse. Obviously our aim is to be centrally weighted on the horse. Another issue with being hunched or collapsed forward is our ability to breathe. If we are collapsed through the chest we are unable to take in full breaths and we are also almost definitely not using our diaphragm. The chest must be open to allow our lungs to take in oxygen. This oxygen provides energy for our entire body not just in cell renewal but also as energy for our muscles. If we deny them of this energy we will not be riding to the best of our ability and we will become tired quicker. We will also be aware as riders how in tune our horses are to our breathing pattern. If we are taking short, shallow breaths this mimics the kind of breathing we might do in a stressful situation and our may well respond accordingly-think invisible monsters in hedges! Another reason to breathe fully whilst riding is to activate the diaphragm. The diaphragm flattens as we breathe in to create more space for oxygen. The Diaphragm is not directly connected to the Psoas but it for want of a better phrase “holds hands” with it as they both have attachments in the low back. Muscles work in teams and any dysfunctional muscles will inhibit its neighbours. A Diaphragm that does not contract/flatten will create an upward pull in the low back and therefore an upward pull on your Psoas. Yes that muscle you are trying to relax all the time may be being pulled upward by your breathing! So, I have two things I want you to try out today. The first one is an exercise to help you open your chest without leaning back or sticking your erm headlights out i.e. we are aiming to as always keep the front and back the same length to create balance and also enable our core to work effectively. Once your chest is open this will increase the capacity in your lungs to take in oxygen-as well as now having lovely alignment! 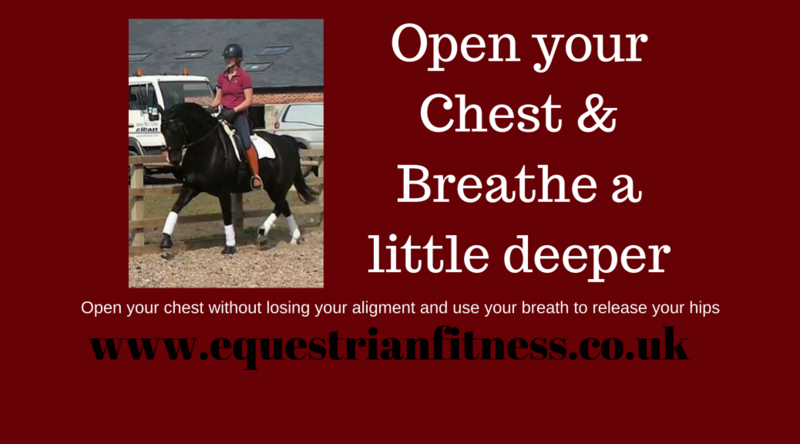 The second exercise is to look at breathing into your diaphragm and encouraging a relaxed Psoas whilst on your horse. The Diaphragmatic breathing as mentioned not only increases your oxygen inhale and therefore energy but also enables your Psoas to fully relax. This exercise is also great to do if you or your horse is particularly tense or nervous; the breathing alone will calm your nervous system down and will translate to your horse. This may be through the Psoas release or it may just be telepathic witchcraft-whichever you believe is fine. Do Riders Really Need To Stretch Their Hips? 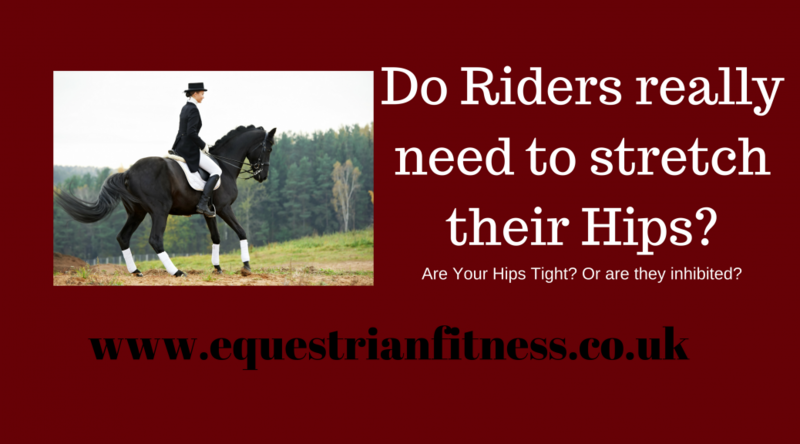 As riders we can be very aware of the feeling of our hips. Very often they can feel “tight” or sore and we will often to be told to stretch them. In some cases this may help, however riding in its very nature encourages out hips to stretch. The opening of the hips to take our legs around the horse stretches out our adductors/inner thigh and the position of our thigh which will be at around 45⁰ or indeed much less in a Dressage Saddle means the Psoas is in a lengthened position. So, in reality any time you are on a horse you are stretching out the front of your hips. The nature of muscles is that they work in pairs synergistically, something called Reciprocal Inhibition This means when one is lengthened its opposite muscle shortens. For example if you bend your knee your hamstrings at the back shorten and your quads at the front lengthen. More specifically in relation to riding as your Psoas lengthens the Glutes at the back contract I,e shorten. This is actually a very clever mechanism designed to protect us as if all of our muscles were to be loose and floppy we wouldn’t be able to stand up! In day to day life most of us will spend the majority of our time sat down at desks, on the sofa or bending forward mucking out, sweeping the yard etc. This whole time your glutes are being lengthened and in its simplest terms-not being used! Then we get on a horse and ask those glutes to work hard! Let’s be honest they just aren’t prepared for it, and it means all the other surrounding stabiliser muscles also not prepared; try and help out . And if they aren’t up to the job then the Psoas isn’t able to fully relax and has to work in contraction. The Psoas hasn’t been trained to do all of this work . In simplest terms the muscles are not working as a team and individually they are too weak. This weakness instead causes them to tense up/over tighten and potentially go into spasm. Stretching muscles in spasm can actually make them worse! For any of my 1 2 1 clients that I see with hip pain I actually programme hip strengthening work, but first we have to take care of any muscle spasm. Here are 3 “anti spasm” releases I recommend you do for a couple of weeks before you begin any strength work. There was an interesting write up in Horse and Hound last week about the increasing incidence of Knee Surgery in Riders. It was written by a surgeon who said Riders need to acknowledge problems early on and get them dealt with by a specialist rather than ignoring it and just carrying on. Very wise words as I know we Equestrians are a tough bunch and despite calling the Vet over the slightest worry with our horse, the same does not go for ourselves. We will just put up with pain and carry on hoping it will go away! Firstly, if you do have a problem it really is best to just go and get it seen by a professional. 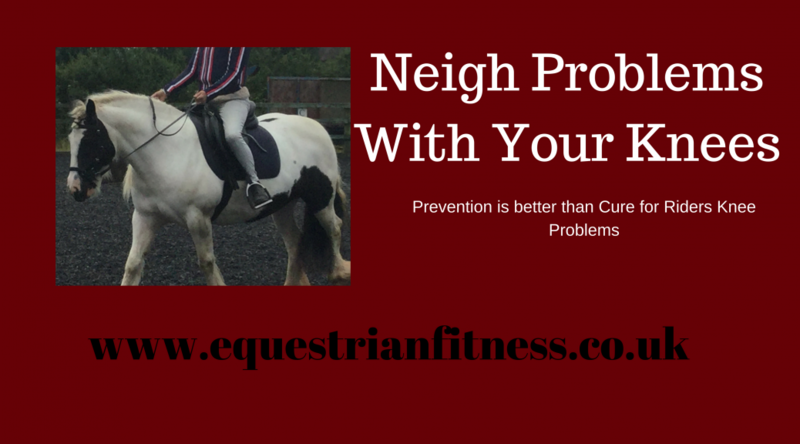 From personal experience I find Sports Physiotherapists (or indeed one that is an equestrian) much happier to help you get back in the saddle pain free than others who can be a little wary. *Not all I’m sure there are loads of great physios out there I’m going from personal experience and I have seen a lot of physios in my time! Mine works at Harris and Ross if you are in need of one and you are in the North West-Just tell Dave I sent you! Anyway, there are also things we can do to prevent ever having a knee problem at all. And the secret is………………….strong legs! You see there are lots of big muscles in your legs, unfortunately as we become more accustomed to riding we can get a little lazy with the muscles we are using and well in a nutshell not really use all of them! 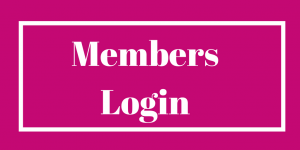 If you saw last week’s blog……..I took you through a Sports Yoga circuit that will help will full body strength so that’s a great place to start, but this week I want to be a little more specific. With that in mind I think we should do a couple of exercises to target the two big muscle groups in our legs. The Quads at the front and the Hamstrings at the back. Wall Squat & Squat Hold. There has been a recent wave of Professional Riders shouting about their weight lifting routines. I think this is great that finally Equestrians are recognising they are as much the athlete as the horse is. I think it has been a long held opinion that the only way to improve your riding is to do more riding. Whilst of course more riding will help, sometimes with so much else going on as you ride (that half a ton underneath spooking at crisp packets…)it can be difficult to really focus on you. Secondly the issue you are struggling with may not be “riding” specific it’s just that you notice it when riding as it prevents you from doing something or at least makes things more difficult. The reason being physically fit and strong improves your riding is because your body will in general perform better as a unit. This is one reason why big compound movements like Squats and Deadlifts are popular along with full body movements like Clean and Press etc. These movements teach you to remain stable whilst moving limbs, which is what we actually do on a horse just much smaller. Also, if you are strong and very stable in your own body a horse that is perhaps not as balanced for example a young horse, will be unable to move you around as much and you will in turn be able to help balance the horse yourself. A strong rider will find it easier to correct things like falling in or out on turns and lateral work. 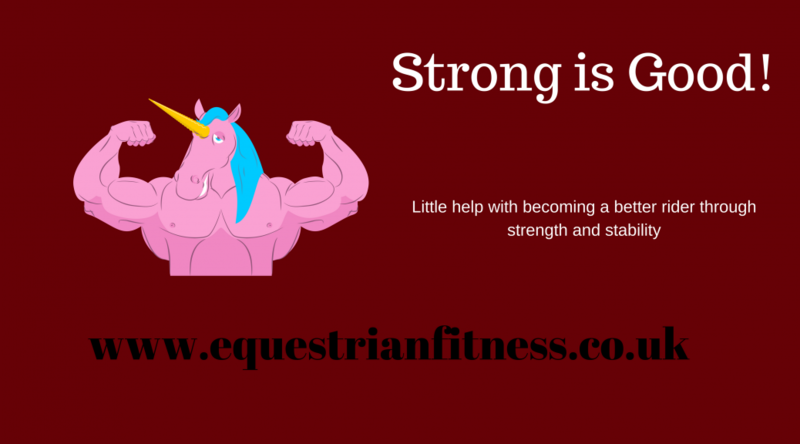 So, if you need a little nudge to get to the gym there is your reason-get strong to improve your riding! Now if you are reading this and the idea of going to the gym and lifting heavy weights horrifies you, don’t panic. It has become my mission to help riders like you improve without spending hours in the gym alongside your work, family and horse commitments. It is still possible to make a huge difference to your riding strength by being just a bit clever with what exercises you do and what muscles you focus on. As mentioned we want a full functioning body that works as a unit from top to bottom. We need it be strong and flexible as well as having good co-ordination and proprioception(awareness of your body in the space around you). To help you I have designed a little Sports Yoga Routine that will help you with all of that. Sports Yoga is unlike “regular yoga” (which is also great) as it incorporates the stability we find in Pilates and then has areas to incorporate further strength work when required. So here is my short routine to get you started. I love to hear how you get on and if you enjoyed it! Are You On Your Forehand? I often see riders with rounded shoulders, perhaps it’s consequence of our lifestyles spent increasingly hunched over desks , phones and tablets etc. or maybe it is a consequence of the professional rider being continually pulled forward by a strong horse, who knows? I have previously mentioned the importance of strengthening the upper and mid back muscles along with those between the shoulder blades and strength in this area will certainly help. However sometimes persistent over use or pro longed poor posture can cause muscles to shorten. In order to aid those back muscles in holding your shoulders open we need to free up the muscles at the front of the chest. In terms of riding there are a couple of reasons why rounded shoulders may be causing a problem. In many riders with rounded shoulders they also tend to have a forward head tilt. This puts extra weight onto the front of the horse and can contribute to a horse being on the forehand. It of course also encourages the rider to lean forward with the extra weight. 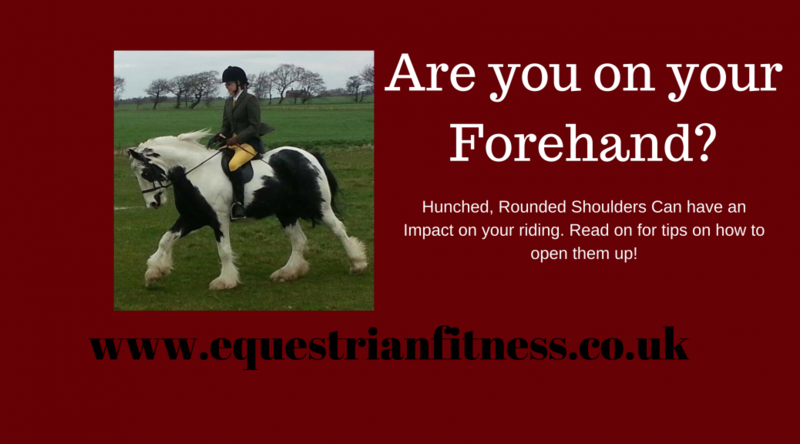 Another reason rounded shoulders may be affecting your riding is your ability to breathe. If your chest is closed you will be unable to take full, deep breaths. The breath is vital for a few reasons in particular we know that horses respond to our breathing rate so short, shallow breathing may communicate to your horse that you are anxious, another reason is the oxygen from the breath is transferred to your muscles around the body to help fuel them to work. The more oxygen you take in the more that can be sent to your muscles. In order to successfully open up your chest muscles we must first consider whether they may be in a low grade spasm, so the first exercise I want you to do may seem a little strange but I promise you if you have problems in this area it will have a great affect. After doing the anti-spasm for a couple of weeks move onto stretching the chest muscles. We can do this two ways, one standing up and one lying down. It is important to note that the chest fibres run in a couple of different directions so to stretch effectively you need to stretch the diagonal fibres and the horizontal fibres. This is easily done in the same stretch just by moving your arm position. Open Shoulders are now yours! I love to hear from you if you have tried these out and how you find them, or if you have a particular topic you would like me to cover.